I know what you’re thinking – “all of our lives around pizza since we were 10 years old” BUT really, my parents opened pizzerias (Stevo’s Pizza in Erie, PA – my dad’s name is not Steve, nor am I a drop Italian) around my hometown when I was young, so pizza genuinely is in my blood. Truly. If you cut me open I’m pretty sure it’d be 80% tomato sauce. I began working at the restaurant when I was 14, and every summer during high school (and my first year of college) was spent chatting with customers, making pizza, and of course, taste testing. I’ve made it my personal, unsolicited mission to try all sorts of pizza from anywhere I can get my hands on it – you may think “unhealthy obsession” but I like to call it, “research.” Luckily, my best friend (Hi Giulia), is always willing to go on a pizza eating spree with me, so I’ve gotten to expose my tastebuds and my waistline to many of the pizza wonders in Erie, Pittsburgh, New York, and beyond. Oh, also, to be fair, I always order a classic margherita pizza to be the baseline for taste testing. 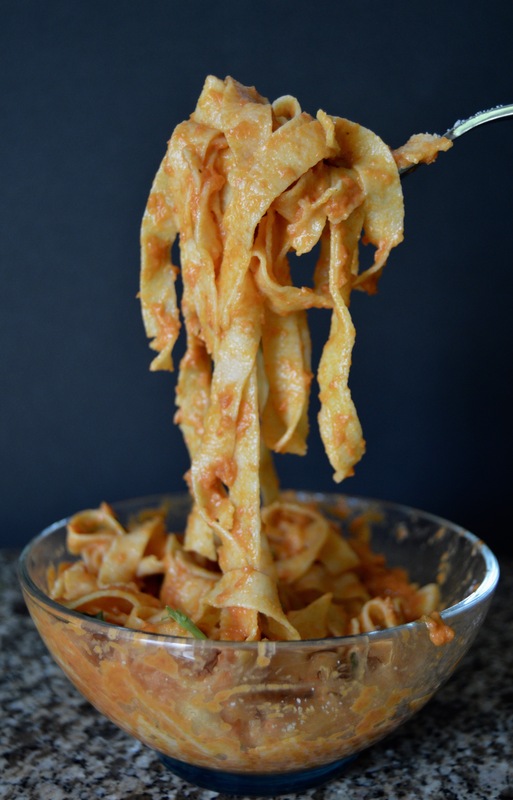 Anyway, in my first year of college, Giulia and I went to a restaurant called Joe Mama’s (yum) and it was my first taste of something that has grown to be near and dear to my heart – vodka sauce. Creamy, smooth, and incredibly rich – the vodka evarporates and adds a lightness to balance the depth of the thick heavy cream (responsible for the beautiful orangey color). This time it was paired with luxurious gnocchi, and the second time, at Aviva Brick Oven, it was the sauce underneath a delicious layer of pizza toppings. 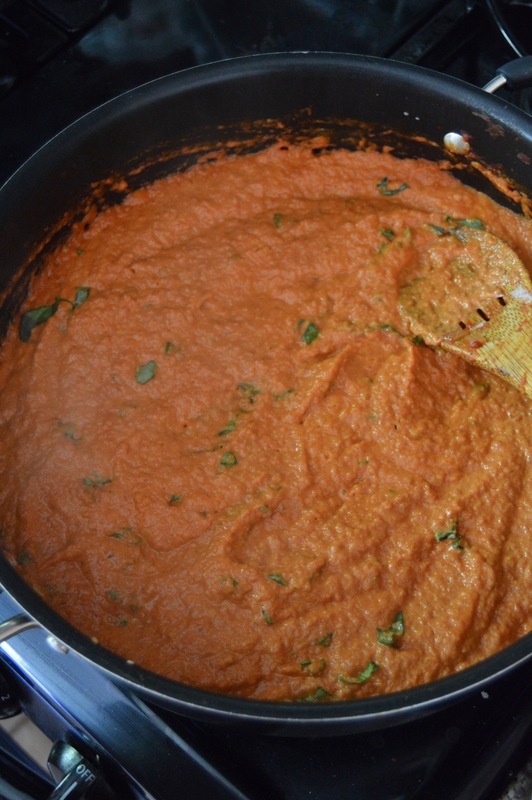 Naturally, it didn’t take long until I wanted to try my hand at making this sauce my own, so after a few trials and filling dinners, Lainey K’s vodka sauce came to be. Salt + pepper, to taste – I use about a teaspoon of salt but taste along the way! Add olive oil to a large pan (with tall sides) on medium heat – after 1 minute, add the onion, garlic, and salt & pepper. Constantly stir to make sure nothing burns – you want to see the onions become light and translucent in color and the smell of garlic to fill the air. Be careful not to brown the ingredients – after 3 – 4 minutes turn the heat to low and allow the onion and garlic to ‘sweat’ for 4 – 5 more minutes. Add the vodka and turn the heat back to medium. Let the vodka begin to evaporate – about 10 minutes. Stir constantly. 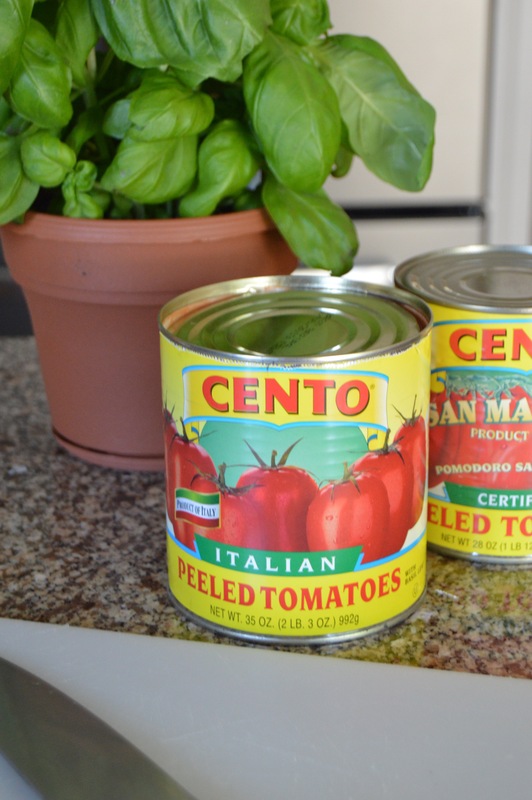 Turn the heat to low and add the cans of tomatoes. Note: I strain the 16 oz. can but not the 35 oz. 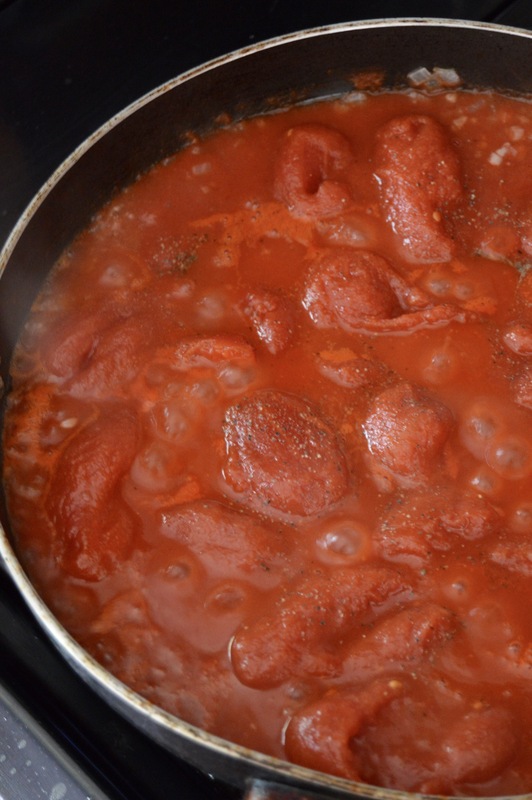 Let the tomato mixture simmer for 20 – 30 minutes, and stir occasionally. When stirring, break up the tomatoes with a wooden spoon, but don’t worry too much about making the sauce smooth just yet. Turn off the heat and add the chunky sauce into a blender and blend until smooth. BE CAREFUL! The mixture will be very, very hot. Add the smooth sauce back into the pan, and turn to medium heat. Add the heavy cream, oregano, and sage – and stir until incorporated. Let simmer for 3 – 4 minutes. 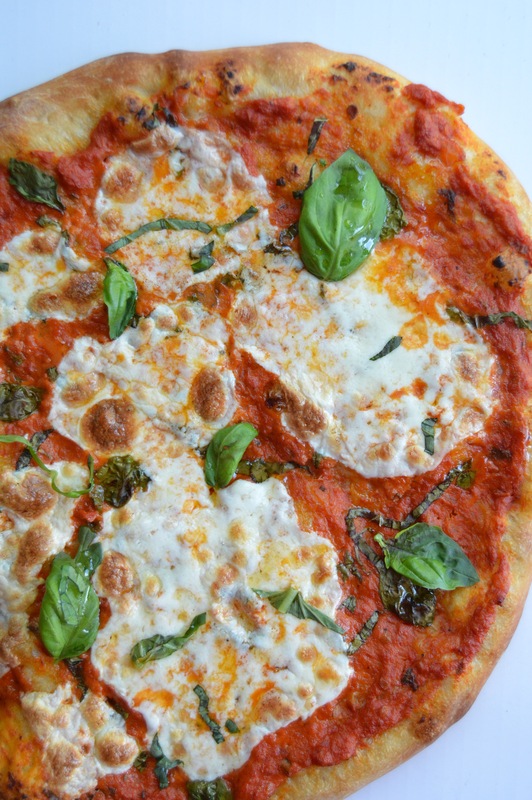 Turn off the heat, add the fresh basil, and put to use! 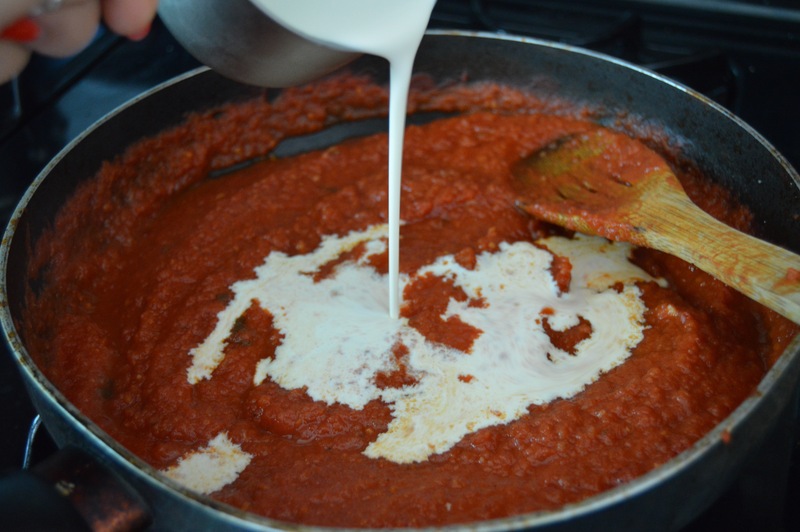 You can use this sauce tossed with some pasta, as a base for pizza, or to eat straight with a spoon.